Abbeylawn supply and fit or deliver flat pack all types of side gates ,We just need the measurement from wall to wall ( or Fence ) and We will make to suit the size of the opening. 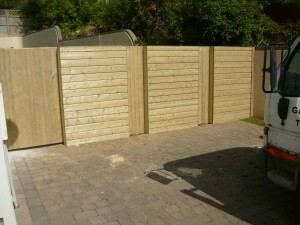 We also make other types of side gates but the tgv is the most used type. All the timber is pressure treated and you can paint it any colour you want after about 2 weeks from fitting. 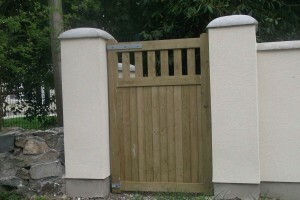 We can supply and fit timber gates in Wicklow, Dublin, Wexford, Kildare, Carlow, Meath and Waterford and other counties in Ireland can also be arranged. 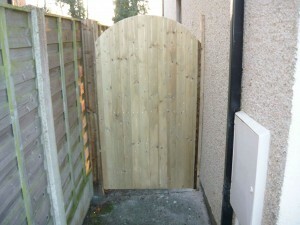 We can design a side gate to suit any opening. We mostly hang off the house wall but this is not always possible and we can fit a timber post and infill panel if required. The picture to the right has an arch over the timber gate. We can supply and fit in Wicklow, Dublin, Wexford, Kildare, Carlow, Meath and Waterford, but other counties in Ireland can also be arranged. The picture to the right has an arch over the gate. This key lock is an optional extra for all of our gates.The key lock allows you to access the side of your house by opening the side gate with a key, and on the inside you just need to press a button to side across the bar on the door.This lock is €50.00 extra. We also have a lock the same that needs a key to open on the inside also.This lock is €60.00 extra. This is a top end side gate. Made from red wood pressure treated and mortised joints. 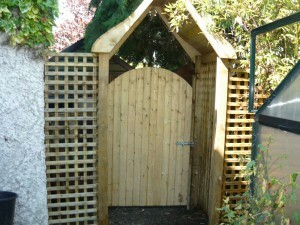 All our Side Gates are made with pressure treated timber. This will give your new gate a long life. We recommend painting them but not for a few weeks from being fitted.this gives the timber time to dry out and then will soak in the paint when you do it.